↑ Originally spelled "Melvill". 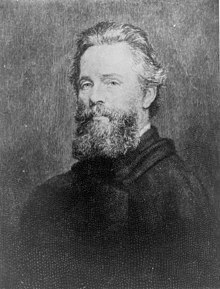 After the death of Melville's father in 1832 his mother added an "e" to the family surname—seemingly at the behest of her son Gansevoort. (Parker 1996), 67. Arvin, Newton (১৯৫০)। Herman Melville। New York: Sloane। অজানা প্যারামিটার |1= উপেক্ষা করা হয়েছে (সাহায্য) Online: Herman Melville. Bercaw Edwards, Mary K. (২০০৯)। "Questioning Typee"। Leviathan। Wiley Periodicals, Inc.। 11 (2): 24–42। আইএসএসএন 1525-6995। Special Issue: Melville in the Marquesas. Guest Editor: Henry Hughes. Leyda, Jay (১৯৬৯)। The Melville Log; a Documentary Life of Herman Melville, 1819– 1891। New York: Gordian Press। with a new chapter. First ed. New York, 1951. Spark, Clare L. (২০০৬)। Hunting Captain Ahab: Psychological Warfare and the Melville Revival। Kent, Ohio: Kent State Univ. Press। আইএসবিএন 0873388887। . --- (1988). Melville's Reading. Revised and Enlarged Edition. University of South Carolina Press. Titus, David K. (1980). "Herman Melville at the Albany Academy", Melville Society Extracts, May 1980, no. 42, pp. 1, 4–10. Retrieved 3 December 2013.